The first Sengoku Basara was incredibly good. It had a lot of action, good graphics, as a hype soundtrack to boot. All of the tactical scenes were also handled well thanks to the music and it made for one complete package. It’s only slight issue was that the end of the show started to feel like a cop out since basically all of the characters survived. This season takes that a little more to the extreme and is just a lot weaker than the first season. It’s still a really good show, but one that should have been better. The Devil King has been defeated so all of the various clans are back to fighting each other. Unfortunately, this peace was never going to last too long. A new villain named Hideyoshi has arisen and he wishes to take over the world for the sake of his ideals. He quickly begins to take over land after land so Date realizes he’ll have to deal with this threat personally. Meanwhile, Sanada heads to the beach to overcome his mid life crisis, but will he be able to deal with all of the dirty techniques his opponents use? Let’s start off with the positives that stayed with the show from the first season. The animation is still really solid. The character designs are on point and this makes for some really fun action scenes. There is a nice contrast whenever it is night or day. Also just about all of Hideyoshi’s fights get a high budget and look spectacular. Furthermore, the soundtrack is excellent as you’d expect. Basically all of the themes from the first season return except for the Devil King’s. I’m glad his didn’t return since it should be exclusive to his character. Replacing that one is Hideyoshi’s theme which is virtually as good. “This is a fight to change the world” makes the fight feel larger in scale and more theatrical. The normal battle themes and talking themes are very solid as well. They did a good job with the selections. Hideyoshi makes for a great villain. While I still prefer the Devil King and consider I’m to be more powerful as well, Hideyoshi doesn’t disappoint in the strength department either. The scene where he punches a hole in the sky was an incredible start and then draining a river with a single punch was also super impressive. If not for some plot had at the end, he would have certainly achieved his vision. More on that later. He may have a twisted sense of justice since he’s a classic “I’ll destroy everybody, but then we’ll be at peace” kind of guy. Sometimes tricking yourself is the only way to get out of answering the tough questions I suppose. Either way, it was a nice surprise to see the show churn out yet another really cool final boss. His subordinate Hanbei was also a good character. Unlike the Devil King who had a few minions, Hanbei is really his only minion. Still, he is in charge of all the tactical operations and is actually loyal for a change so that’s nice. He’s a good fighter although he’s a little naive. I don’t think Kojuro would have ever joined his ranks so the mind games felt rather futile. I would have liked to have seen him fight more since he only got 2 action scenes, but he did well in both of them. He had the upper hand against Date and was also beating Kojuro until his illness took control of him. He made for a great lieutenant and I definitely wish that Yukimura had gotten a swing at him. As expected, the cast of returning characters here is very solid as well. Date has moved up from being a dual main character in the first season to being the complete lead in this one. He may lose a few fights here and there, but overall I’d say that he definitely looked really good. After all, his personality is the main important thing. Even without his right eye, Date continued to show some strategy and foresight into his plans which was nice to see. He didn’t become a commander for nothing after all. He definitely worked well as the main character in Yukimura’s place. Kojuro got a larger role here as well. He’s always been one of the main characters, but he has another big role here since he was kidnapped and forced to watch the villains plan things out for a while. He eventually got out and was able to claim his vengeance, but his intelligence was certainly praised a lot. Even when he was entirely out of the loop he could predict what everyone was doing. He’s probably the best tactician in the show and was shown to be capable of foiling Hanbei as well. I suppose Mori could give him a run for his money in the intelligence department, but I like to think Kojuro has the lead. Motochika also got a much larger role here. His army is usually at a disadvantage since it’s smaller in size when compared to the other, but his large battleship always keeps him in the running. He’s got a pretty good personality and doesn’t back down from a fight. I was definitely cool with seeing more of him here and I’m just sad that we wasted an episode with him during the whole mountain exploding debacle. I think having him team up with Date to fight Hideyoshi made a lot of sense instead of sending him off to an off screen climax. He did a great job while he was on screen though and his weapon is pretty unique. The show’s actually pretty good with that as most of the characters use different weapons as opposed to the same sword. One other new character was a ninja who served Matsunaga. He’s apparently extremely strong and he ends up winning his only fight in the series. He’s another character who just appeared out of the blue and I would have liked to have seen more of him. Ah well, perhaps in the next season. What I just want to know is how Matsunaga can hold his own against guys like Date when he seems like the kind of guy who just sits on a throne all day? I can’t picture him training. Despite all the positives, there were certainly some negatives that got thrown into the show and became a bit of a problem. Let’s start with Yukimura. His character seems to go in circles as he deals with fears that he overcame in the first season. Once again, he is unsure of whether he is doing the right thing or not since he is taking a lot of lives even if it’s for the sake of peace. This causes him to go train on a beach…for almost the whole series. Those episodes are all complete filler and Yukimura doesn’t even get to take on the final boss like Date. Yukimura’s fight with Date in episode 1 is great, I’ll give him that. Unfortunately, that’s the only fight you’ll get to see Yukimura have. Even his big climax battle isn’t really a fight, it’s just him doing one really big tackle and maybe 1-2 minutes of actual swordsmanship at best. Yukimura is still my favorite Sengoku character so this was pretty disappointing. He was absolutely given the shaft here. Also, the show made it seem like he made the wrong decision by trying to help Motochika instead of continuing with the mission. 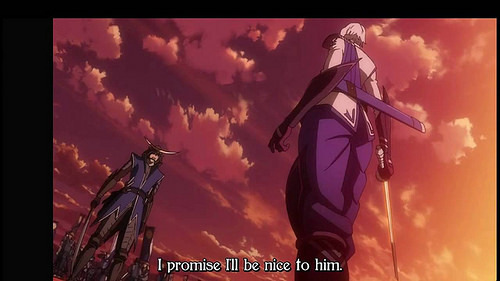 His effort to save him was in vain (Although Motochika lived since Sengoku Basara lets everyone live) and then everyone basically blamed him. Yukimura was rather half hearted the whole time, but it was still the right decision. That carries into another point, the show seemed to just have a very poor director or whoever plotted the scenes. Several times an episode would end with an epic cliffhanger only for it to just be skipped over in the next episode. This episode had ended with Yukimura’s team taking the field. The next one starts with the battle already over and they explain that Yukimura lost. A significant amount of fights are off screen in this title which is pretty unacceptable. I feel like the writers weren’t sure if they should continue their story or turn the show into a history lesson at times. It was just very inconsistent and as a result, we saw less fights than we should have. The show’s problem of having everyone avert death is another issue. It was starting to get bad in season 1, but it’s far worse here. Motochika is basically destroyed by Hideyoshi as he is punched through a battleship and the episode heavily implies that he is dead. Nah, the guy shows up in the next episode. Matsunaga died in season 1, but returns here. Honestly, his episodes have no point and are basically filler. There was no reason to bring him back. Lady Nohime also comes back from the grave. I’m telling you, nobody stays dead here except for the main villain group of the season and even then subordinates seem to come back if they try hard enough. The show needs to just be bold and let the characters die. At the very least, fix the power levels. If Sengoku Basara’s death problem is basically turning it into the Fairy Tail or Shonen, it’s wonky power levels are second only to Dragon Ball Super. The problem here is that the show acts as if everyone has the same exact power level. Date, Yukimura, (Lost by a fraction) Motochika, Yukmura’s master, the Ice Master, Keiji, Hideyoshi’s lieutenant, Matsunaga, Matsunaga’s assistant, etc, etc. They all have the same power level so just about every fight in the entire season is a stalemate. That gets really old after a while. I don’t want to constantly be seeing matches end in a draw over and over again. I feel like this is because the writers want all of the characters to stay hype and cool when that is not what should be happening at all. Even if your favorite character loses, at least you’ll know that it was a good fight. If it’s a tie, then it ultimately ends up feeling like a waste. For the matches that aren’t ties, they can be even worse. Look at Date vs Hideyoshi the final round. Date was getting completely clobbered during the entire fight. Hideyoshi was way stronger and he also appeared to be faster. 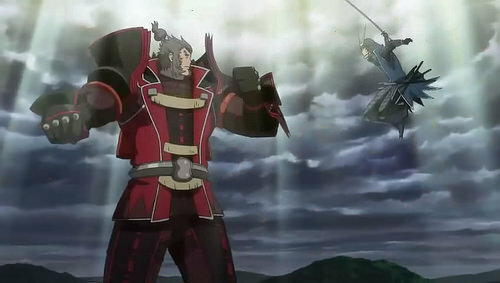 Then after Hideyoshi “won”, Date gets up with the power of friendship and defeats him in a single hit. Of all the anticlimactic, plot hax endings, that’s how you finish it? It has to go up as one of the most random victories along with Soul Eater’s ending. The anime built up Hideyoshi way too much during the arc which ended up backfiring horribly. He was simply too strong so the anime had two options. They could have had a big team up fight where Date allies himself with other commanders or they could have simply not built him up as much. Also, I mentioned that Samurai Jack’s ending was pretty rushed. Well this one told tat show to hold its Katana because this one tops that. We have around 6-7 big fights going on and a ton of plots in the final episode. This may attribute to why Date’s fight was so rushed at the end and likewise the other scenes don’t get much screen time. Quite a few new characters even show up in this last episode which was just really weird. They got some hype and appeared in the shadows, but only had time for one clash before we got a cut away and then the rest of the fight was off screen. The whole thing was bizarre. I suppose it was meant as a homage to the games since the characters probably had their own stories there, but if you’re going to include them in the story, find a role for them. It’s like how Brawl couldn’t squeeze in Toon Link, Wolf, or Jigglypuff so they put them in secret rooms. Fortunately, there is a movie and a third season so this should hopefully help with that. If anything, they would have worked well as a stinger in that case. As with the first show, there is a bonus episode/OVA that is included along with it. It shows how Yukimura participated in the Man event with Date back when they were nursing him back to health. It’s a fun enough special as they get to have some fighting accomplished and all. The power levels were still out of whack as Sasuke got way too much hype, but at least Date didn’t actually lose. It was a fun enough episode and while it wasn’t serious, we never did get a chance to see the characters just hang out before this so I’d say that it worked pretty well. Yukimura’s squad definitely has the most fun out of all the groups. Aside from Yukimura’s character being wrecked in this season, most of the characters were on point. Date shined quite a lot in his main character role. All of the other captains were around as per usual even if they didn’t do much. Kasuga’s recycled fanservice image is as old as it ever was, but fortunately it is only used once or twice this time since her role was greatly reduced this time. Her commander also doesn’t appear much, but does a good job of not actually harming anyone. Stalling Date for no reason definitely seemed rather pointless if you ask me though. However, I said that most of the characters were on point, there is one other figure who looked really bad here, Keiji. Keiji’s whole gimmick is that he’s all for peace and rarely tries to fight. He wants to be diplomatic and he used to be friends with Hideyoshi. However, it’s heavily implied that Hideyoshi destroyed one of their mutual friends (The anime never goes into it and I’m sure glad they don’t to be honest. The plot should have never even existed since it just seems to go against his character entirely) so a rift formed between them. He tries to solve things peacefully but it doesn’t work and he gets ignored. Finally, he realizes that the time to act has come and heads off to meet Hideyoshi. Unfortunately, he gets cold feet at the last second and lets the guy steamroll him, losing without trying to fight back. That scene was pretty brutal since you can’t just keep trying the same tactic over and over again and hope to win. Especially since Hideyoshi made it clear that he’s going to conquer the land and innocents are also targeted in his campaign. After a while, it you refuse to fight the enemy, you may as well be aiding them. Keiji’s friends are just as bad though. Even after the Devil King back stabbed them, they have decided to join forces with Hideyoshi once more. I don’t get their rationale for this at all. They know that he is evil, but they still go through with it. It’s like they’ve learned nothing from their last encounter which could be another example of no character development or regression. Fortunately, Keiji breaks his rule this time to take them out and becomes head of the clan so they can’t do anything, but those guys were definitely annoying. Keep in mind that this episode is only 12 episodes long and we have all of these characters and various plots running around. It’s no wonder why the whole thing was so rushed. I feel like the writers really wanted a 26 episode show and were only given 12, but they didn’t want to cut anything out. That would certainly explain quite a lot in the show. It’s not really a legitimate excuse, but at least it’ll make the whole thing make sense. While I definitely had a lot of negative things to say about the show, that’s mainly because the first season just set such a high standard. Compared to the rather tight plot of the first season, this one was incredibly scattered. It just included too many characters and plots that should not have arrived since they ultimately didn’t contribute anything to the story. Still, it kept all of the elements that made the show as good as it was. We get a lot of really Hype moments throughout even if you discount the Hideyoshi moments. (Those were certainly the best ones though) Just about all of the characters get to shine. While the show has about as many hype characters as World Trigger and should probably have a few of them lose, it still does make for fun matchups. While it got a little more jaded here compared to season 1 since you knew they would all be ties, it still works to an extent. It’s a step down, but just as a Lasagna is a step down from pizza, it’s still a very good product in the end. 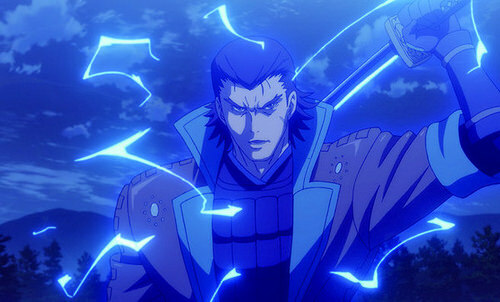 Overall, Sengoku Basara crumbled under the pressure of its own ambitions. Still, the animation is rock solid and the soundtrack is amazing. The character cast is very solid and the writing is on point. You’ll never be bored during the show except for possibly the Yukimura filler episodes. Even just seeing the characters talk and plot strategies on the board is always interesting. I do enjoy that kind of thing as I like to see strategies unfold. It further emphasizes how ambitious the show was as many different pieces would be moving as once. Everyone had a plan and the villains would try to anticipate these plans and counter with their own. It was all very intricate and interesting. That’s why it would always be regrettable when the outcome would be off screen. Anyway, I definitely recommend watching this show. It may drop the ball on a bunch of things, but still has more than enough to let it compete with just about any other title. It’s definitely still one of my favorite recent franchises and I look forward to seeing what they do in the sequels. Ideally Yukimura will get a larger role coming up. 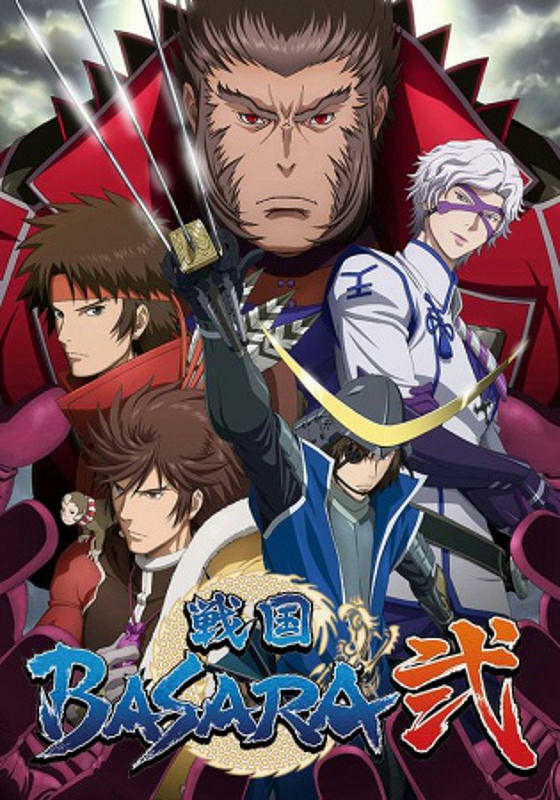 This entry was posted in 7 Star TV Shows, Reviews, TV Show Reviews, TV Shows and tagged Action, Anime, Anime Review, Review, Sengoku Basara, Sengoku Basara II, Thriller, TV Show, TV Show Review by dreager1. Bookmark the permalink.